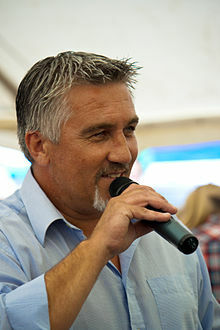 Paul John Hollywood (born 1 March 1966) is an English celebrity chef and television presenter, best known for being a judge on The Great British Bake Off. He began his career at his father's bakery as a teenager and went on to serve as head baker at a number of hotels around Britain and internationally. After returning from working in Cyprus, Hollywood began appearing in guest spots on a number of British television programmes on both BBC and ITV. Although Hollywood's broadcast career began with food programming he has since branched out into other genres, including motoring. Paul John Hollywood was born in 1966 in Wallasey, on the Wirral, in Cheshire[a], the son of bakery proprietor John F. Hollywood and Gillian M. Harman. He was a pupil at The Mosslands School. Hollywood studied sculpture at the Wallasey School of Art but left the school to start work as a baker. He first worked in his father's bakery in York (the headquarters of a chain called Bread Winner which eventually stretched all the way down the east coast from Aberdeen to Lincolnshire) and then in other bakeries on Merseyside. He eventually went on to become head baker at a number of hotels including The Dorchester, Chester Grosvenor and Spa, and the Cliveden Hotel. He then left the UK for Cyprus, where he worked at two resorts. Hollywood has appeared in guest spots on a number of television programmes, including BBC One's The Generation Game, The Heaven and Earth Show, ITV's This Morning, and The Alan Titchmarsh Show. Since the show launched in 2010, Hollywood has been a judge on the BBC programme The Great British Bake Off. In this capacity, he has been described as the "antidote" to judges such as Len Goodman or Simon Cowell in other reality television programmes, on account of his straightforward and honest manner and because his judging is restricted purely to the finished product. His partnership with Mary Berry has been described in The Guardian as being the "secret weapon" of the show and potentially one of the best judging combinations to have appeared on reality television. In September 2016, Love Productions agreed to a three-year deal to move the show from the BBC to Channel 4. Hosts Mel Giedroyc and Sue Perkins announced that they would not be moving to the new network, followed shortly after by Berry. On the same day as Berry, Hollywood announced that he would be staying with the show. The Gourmand World Cookbook Awards named his 2005 book 100 Great Breads as the "Top Bread and Pastry Book" for that year. In 2008, Hollywood created an almond and roquefort sourdough recipe that was said to be the most expensive bread in Britain. The roquefort is supplied from a specialist in France at £15 per kilo, while the flour for the bread is made by a miller in Wiltshire. Hollywood describes it as a "Rolls-Royce of loaves". Hollywood is a guest speaker at several food festivals, including the Cumbrian Food Festival, and the BBC Good Food Show and the Cake and Bake Show, both in London. In May 2013, Hollywood began appearing as a judge on The American Baking Competition on CBS. Hollywood has also starred in Sadie J, a children’s television programme. In 2013, he presented Paul Hollywood’s Bread on BBC Two, in which he gave advice on recipes for different types of bread; however, also featured on the series were recipes for some cakes such as the Danish pastry. He also presented Paul Hollywood's Pies and Puds, a cookery television series on BBC One. In August 2015 Hollywood was featured on the BBC genealogy documentary series Who Do You Think You Are? The programme revealed that his grandfather Norman Harman, who served in the Army during World War II, saw action in the Tunisia Campaign and at the Battle of Anzio and that his great-great-grandfather, Kenneth MacKenzie, had been a policeman in the City of Glasgow Police in the 1850s. Hollywood's great-great-great-grandfather, Donald MacKenzie, had been a crofter in Poolewe, Wester Ross. Donald had also been the post-runner between Poolewe and Dingwall, where he delivered post on foot over a distance of 60 miles (97 km). He covered this distance every week, during his forties, on foot for over a decade. He lived into his 80s. In May and June 2017 he presented Paul Hollywood's Big Continental Road Trip. In December 2017, Hollywood appeared as a judge on The Great American Baking Show, the second incarnation of the GBBO series in the United States. In 2015 Hollywood began his racing career, making his debut in the Beechdean AMR Aston Martin Vantage GT4 with Andrew Howard, founder of Beechdean Dairies. The pair qualified second in the Britcar Trophy Championship's first round at Silverstone taking second in class in both races. He also competed at Le Mans in 2015 in the Aston Martin festival. Hollywood has also competed in GT Cup with Jonny Adam and finished first in class. He entered the British GT championship in 2016 and competed in the last three rounds with Jamie Chadwick as his driving partner. In July 2017 he came first in class at the Dunlop endurance race at Silverstone in an Aston Martin GT4, and in November 2017 he raced in his first 24 hr race at Circuit of the Americas coming second in class in an Aston Martin GT8. Hollywood met his future wife, Alexandra (Alex), in Cyprus where he was a head baker at a five star hotel and she was a scuba diving instructor. They later married on the island. Paul and Alex separated in 2013, after he admitted to an affair with his The American Baking Competition co-host Marcela Valladolid, reconciled, then separated again in November 2017. ^ "Paul Hollywood". IMDb. Retrieved 29 December 2017. ^ Hollywood, Paul (2017). A Baker's Life: 100 fantastic recipes, from childhood bakes to five-star excellence. Bloomsbury Publishing. ISBN 978-1408846506. ^ Coligan, Nick (20 September 2011). "Wallasey chef Paul Hollywood on his role in The Great British Bake-Off". Liverpool Echo. Archived from the original on 29 March 2012. Retrieved 31 March 2012. ^ a b "Paul Hollywood". UKTV Food. Retrieved 31 March 2012. ^ Greenaway, Heather (6 March 2012). "Celebrity chef Paul Hollywood: I piled on the pounds during the Great British Bake Off". The Daily Record. Archived from the original on 7 March 2012. Retrieved 31 March 2012. ^ Heritidge, Stuart (15 September 2010). "Paul Hollywood: TV's rising star". The Guardian. London. Retrieved 31 March 2012. ^ Hertidge, Stuart (7 September 2011). "Mary Berry and Paul Hollywood: the best reality TV judges ever?". The Guardian. London. Retrieved 31 March 2012. ^ Foster, Patrick (12 September 2016). "BBC loses Great British Bake Off, as Channel 4 swoops for corporation's biggest show". The Daily Telegraph. Telegraph Media Group. Retrieved 12 September 2016. ^ a b "Paul Hollywood". BBC Good Food Show. Archived from the original on 29 December 2011. Retrieved 31 March 2012. ^ a b Cockcroft, Lucy (8 December 2008). "Britain's most expensive bread goes on sale at Harrods for £15 a loaf". The Daily Telegraph. Retrieved 31 March 2012. ^ "Bake Off Star Paul Hollywood Guest at Cumbrian Food Festival". News and Star. 5 November 2011. Archived from the original on 22 May 2012. Retrieved 31 March 2012. ^ "Paul Hollywood". The Cake and Bake Show. Archived from the original on 21 January 2012. Retrieved 31 March 2012. ^ "BBC One - Who Do You Think You Are?, Series 12, Paul Hollywood". Bbc.co.uk. 13 August 2015. Retrieved 14 August 2015. ^ Sturges, Fiona (27 May 2017). "Paul Hollywood's Big Continental Trip – like watching a lifer on day release". the Guardian. Retrieved 19 October 2018. ^ "'The Great American Baking Show' Premieres Thursday, December 7". ABC. Archived from the original on 28 October 2017. Retrieved 27 October 2017. ^ "Aston Martin Racing hosts Michelin Aston Martin Le Mans Festival". sportscarillustrated.com. Sports Car Illustrated Inc. Archived from the original on 4 September 2017. Retrieved 5 November 2015. ^ Rainbow, Lottie. "GT cup2 Beechdean AMR GT4 Car Baking Hot with Paul Hollywood's GT Cup Class Win". www.beechdeanmotosport.co.uk. Beechdean Motosport. Archived from the original on 18 February 2018. Retrieved 5 November 2015. ^ Nicholas, Sadie (25 February 2015). "Paul Hollywood's wife Alex proves she's the hottest cook in the kitchen". Express.co.uk. Retrieved 2 June 2017. ^ Mulley, Laura (4 December 2016). "In the closet with Great British Bake Off star Paul Hollywood's wife Alex". Retrieved 29 December 2017. ^ "Paul Hollywood splits from his wife after 20 years". BBC News. 20 November 2017. Retrieved 30 November 2017. ^ Ruby, Jennifer (20 November 2017). "Paul Hollywood announces split from wife Alexandra after nearly 20 years of marriage". Evening Standard. ^ "Great British Bake Off host Paul Hollywood and wife separate". Daily Telegraph. 20 November 2017. ^ Westbrook, Caroline. "Paul Hollywood and wife Alex to split after nearly 20 years of marriage". Metro. Retrieved 7 March 2018.